Egypt Unrest: A "Major Political Tsunami"
ISLAMABAD - As Egyptian President Hosni Mubarak fights for survival in the face of rapidly growing protests on the streets of a country he has ruled with an iron hand, diplomats and analysts across the region are bracing for a period of growing instability that presents fresh challenges to a host of players. "An unexpected turn of events is probably an understatement. Egypt is now witnessing a major political tsunami with consequences for its surrounding region," warns an Arab diplomat from a Middle Eastern country who served in Cairo until last August. Speaking to CBS News on condition of anonymity, the diplomat warned of "a variety of dangers" following a regime change in Egypt. Going forward, he listed the emerging possibilities, ranging from "a significant rise of Islamic militants in Egypt who will take a harder line towards the U.S. and Israel," to "Egypt becoming a symbol of change for others to follow." While President Mubarak for now appears to be defying the odds, Egypt is becoming increasingly locked in a state of growing paralysis that is forcing many analysts to resign themselves to a regime change. Meanwhile, the return of Mohamed El-Baradei to lead the protests has raised the possibility of a future government led by a figure who will pursue internal reforms while retaining links to the U.S., Israel and other outside powers. Baradei, the internationally respected Nobel laureate and former head of the International Atomic Energy Agency (IAEA), the global nuclear watchdog, is among the few Egyptians with a well-established international profile. Yet, Baradei's emergence to lead a future regime does not conclusively block the possibility of a period of turmoil. Analysts warn a future democratic regime elected through a popular vote is likely to also give political gains to Egypt's Muslim brotherhood, or "Akhwan al muslimeen" - the country's best-known and organized Islamic political force with a long term commitment to the imposition of Islamic rule. Mubarak, in his three decades as Egypt's president, has frequently presented himself to foreign powers (notably the U.S., European countries and Israel) as the most effective bulwark against hard line Islamists waiting to take charge of his country. Leaders of the Brotherhood movement have frequently complained of having their followers picked up by Egypt's security forces, confined to illegal safe houses and tortured. But the Brotherhood movement has also built up its ranks among Egypt's poverty-stricken neighborhoods, making inroads in communities that have felt marginalized in spite of periods of strong national economic growth. "The Islamic Brotherhood has assumed a role as the key representative of Egypt's underdog. In a volatile situation as we have today, these people have the perfect opportunity to be heard as never before," says a second Arab diplomat who until 2009 served at his country's embassy in Cairo. Speaking to CBS News (also on condition of anonymity), the diplomat warned: "Once Hosni Mubarak is gone, there will be calls for a more representative democracy. It would then be impossible to keep the Muslim Brotherhood out (of power), especially if Egypt holds elections." For the U.S. and Israel, the political rise of the Islamic Brotherhood may translate into a hardening of Egypt's policies towards the two countries. Egypt has the distinction of being the first Arab country which restored diplomatic ties to Israel after the 1973 Arab-Israeli war, in spite of opposition from Islamic groups across the Muslim world. Meanwhile, security officials in the Afghanistan-Pakistan region also warn of an uncertain future tied to ongoing U.S.-backed efforts for confronting hard line groups, notably the Taliban and al Qaeda. 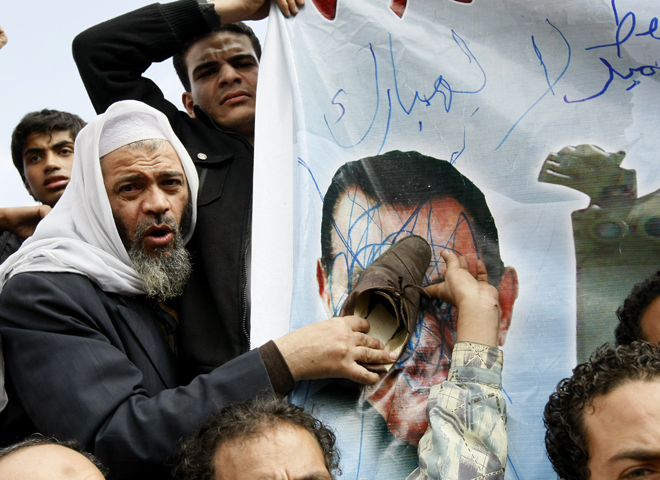 On the one hand, an abrupt regime change in Egypt will likely work to inspire dissident groups in parts of Africa, the Middle East and Asia to step up campaigns against their rulers. On the other hand, there may be further uncertainty surrounding the future of an ongoing campaign by Egyptian security forces to target Islamic hardliners connected to Ayman al-Zawahiri, the second highest ranking leader of al Qaeda. The Egyptian doctor-turned-militant, who is the second-highest-ranking figure in his movement after Osama bin Laden, has been rumored to have quietly expanded the network of supporters in his native Egypt. "I believe events in Egypt have a real chance of spilling over. This is a volcano with real lava waiting to spill over," said a Pakistani security official who spoke to CBS News on condition that he would not be named as he is not authorized to speak to journalists. "We know Ayman al-Zawahiri has tried repeatedly to create trouble in his country. Given the developments in Egypt, it will be vital to watch if people like him will get a chance to exploit the situation even more than before."